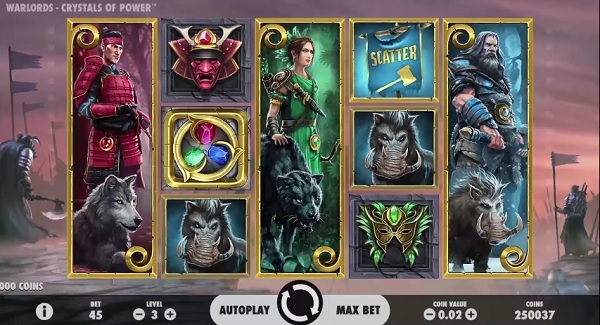 You would be wrong to assume that NetEnt could go wrong with their slot choices and Warlords: Crystals of Power is just another one of their slot game which additionally raises the bar. You high expectations will have been met with brand new 5-reel, 3-row and 30-payline set-up which is quite affordable and substantially rewarding at the same time. We will not deviate from the subject and will go straight to the point here – Warlords: Crystals of Power is an impressive game, in every sense of the word. Graphics to NetEnt’s latest title are created in high definition and are considered to be state-of-the-art with their animated touch. Presented in a true cinematic fashion, Warlords: Crystals of Power will make you believe like you have stepped inside the world of its own with that cutting-edge 3D touch. The game’s interface offers mind-blowing visuals and animated details which are brought about every time something of significance happens on the reels. And to quickly move on to those significant things in the game it needs to be stated that Warlords will present you with a dynamic and playful composition filled with all sorts of features. Straight from the base game there is the Random Overlay Wild Feature which brings about new Wilds in neat graphics which will see a Hammer hitting the screen to make a huge 2-2 box filled with wilds, Arrows flying to the reels to turn symbols Wild and a Sword slicing the grid to help you win big and even bigger. Two Scatters will give you a cash win in the base game, while it will also engage the Battle Feature during which it will be determined if you will be given a cash prize or another Scatter to help you claim the Free Spins. Those free games come in different form, corresponding to each ruler fighting among themselves. Last but not least, Warlords: Crystals of Power is a fairly rewarding game which brings plenty of value to your money and up to 6,666x your stakes, which is another thing we love about it. Warlords: Crystals of Power is one extremely eventful game, perhaps even a bit too eventful even for NetEnt’s standards. A fairly straightforward gameplay looks complicated, which it actually isn’t, but is quite enough to arise confusion among gamers. You get different ways of initiating the Free Spins feature which, if you don’t, you get re-spins, and another chance to do it, which is all swell, but a bit tedious. From our experience and a couple of spins we had, wins are not that often and free spins can be just too mundane to play. Additional spins are available, but seeing them drill down the dead wood can be a bit frustrating. At least that was the case with us here. We love NetEnt’s games and enjoy them thoroughly, which is the case with Warlords: Crystals of Power as well. NetEnt has ticked all the boxes to be honest and despite some tediousness involved in the spins themselves due to the abundance of various features connected to three different rulers, this great title of theirs deserves our warmest recommendation.